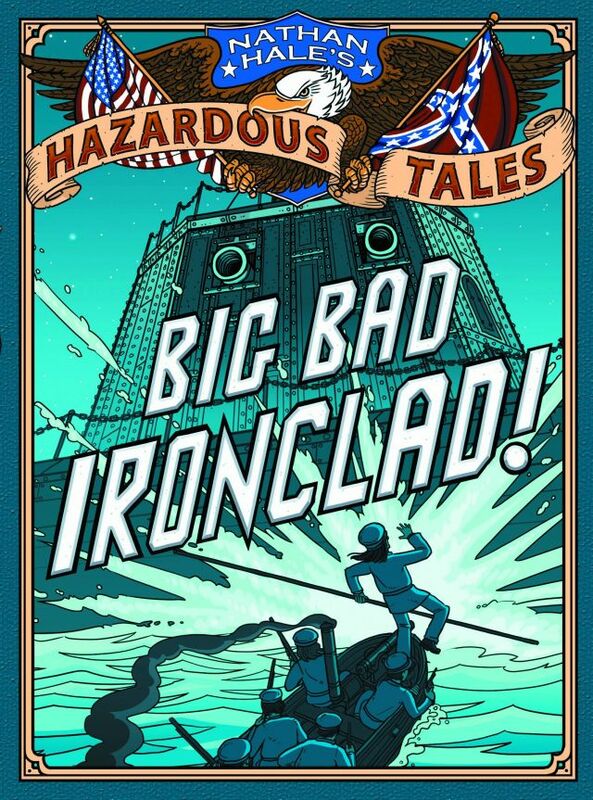 Nathan Hale's Hazardous Tales are a graphic novel series telling bits of history. Nathan Hale was a famous American spy during their Revolutionary War who is best known for his last words: "I regret that I have but one life to give for my country." The author of this series shares the same name, and latched onto the idea of using his namesake as the narrator of this series. So the very first book begins with American spy Nathan Hale being led to his hanging. There he gives his famous last words and then, in a moment of creative license, is eaten by "The Big Huge Book of American History." Why was he eaten? Well, because his last words were so good, they got him into the history books. Shortly afterwards he is spit back out and Hale explains that while he was in the history book he got a peek at future events, and has quite some stories to share. So share he does, with the Hangman, and the British provost guarding him. The three of them act as comic relief, interjecting comments throughout, with the tall British solider as the the stiff straight man, and the shorter rounder Hangman as his loud emotional sidekick - it's a inventive riff off of Abbot and Costello. Some of these accounts are quite weighty so the humor helps make these stories appropriate for a younger age group then they would otherwise have been, with only the very occasional joke that borders on bad taste (as is bound to happen when humor is injected into serious situations - a mistake or two is going to happen). A few decades ago a cartoonist decided to tell the story of the Jewish Holocaust in World War II via an animal metaphor. He made the Jews mice, and the Germans cats, the good folk dogs and the collaborators were pigs. It was a dark story, of course, but the use of the animals made it slightly less gritty, and thus more bearable. bulldogs, the Belgians are lions, the Ottomans are otters, the Russians bears and the Americans get stuck being bunnies, because eagle has already been taken. Hale does a good job of laying out the facts, and detailing the slaughter that amounted in the millions, but also lightening things up with doses of humor whenever he can. I knew the basic facts of World War I already, but learned a lot from this overview. Of course a comic, particularly one presented in metaphor form, shouldn't be regarded as an authoritative source, but it does provide a useful overview. Now if I want to find out more, I've now learned enough to know what I might want to read more about. 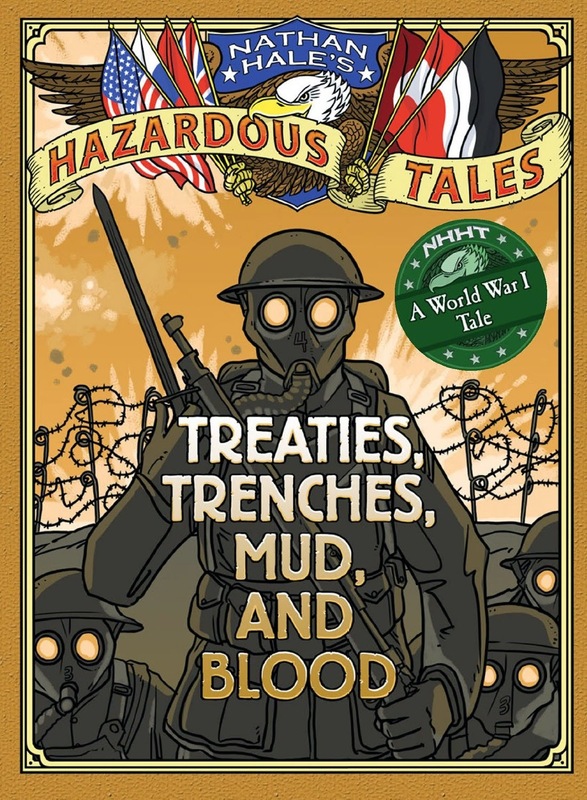 This book is one of in a series of "Nathan Hale's Hazardous Tales" and it's a unclear whether the series is named after the author Nathan Hale, or the American spy Nathan Hale who lived 250 years ago, but who appears in this series as the narrator. But I guess it doesn't much matter. A couple cautions to share: this is a historic account that details the death of millions, so even though it is in animal comic form parts of it would be too much for the very young. I'm not talking about gore - there isn't any - but rather the story itself. Also a language advisory: a couple of "good heavens"s pop up, a "holy moley" and in one instances a character says, "ye gods" (page 73). I'd recommend this for children 12 and up, though some kids might be able to handle it as young as 10. You can buy a copy by clicking on the link to Amazon.com here. 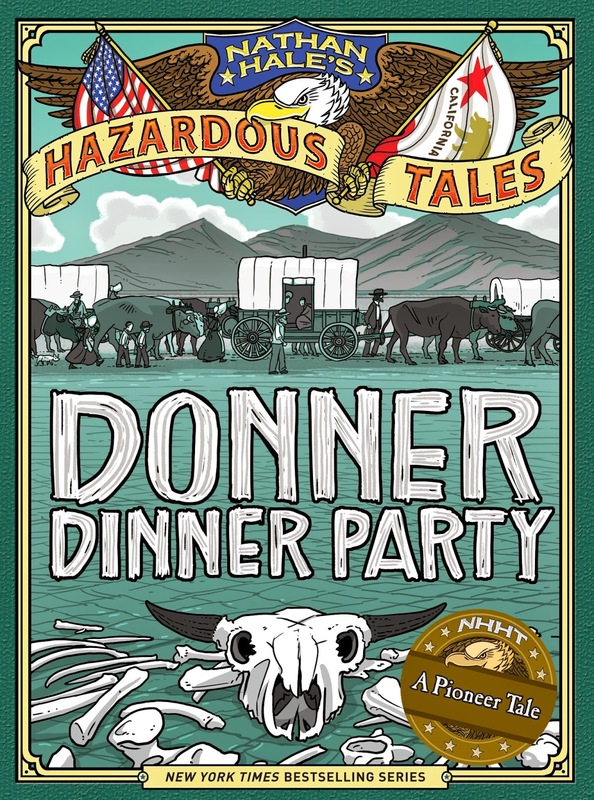 The general gist of this tale is well known: the Donner party was a caravan of settlers heading to California that took an ill-advised short-cut and to survive the winter had to eat their dead. So this might not seem the sort of story that is well suited for a graphic novel account: too dark and disturbing. There is certainly something to that, but author Nathan Hale does ensure this is, at most, a PG-rated account - there is no gore of any sort, save one panel in which a man is stabbed and that is as muted as a stabbing can be. I enjoyed learning the true (or mostly true - the author fills in the gaps with his imagination) story behind the popular folk tale. 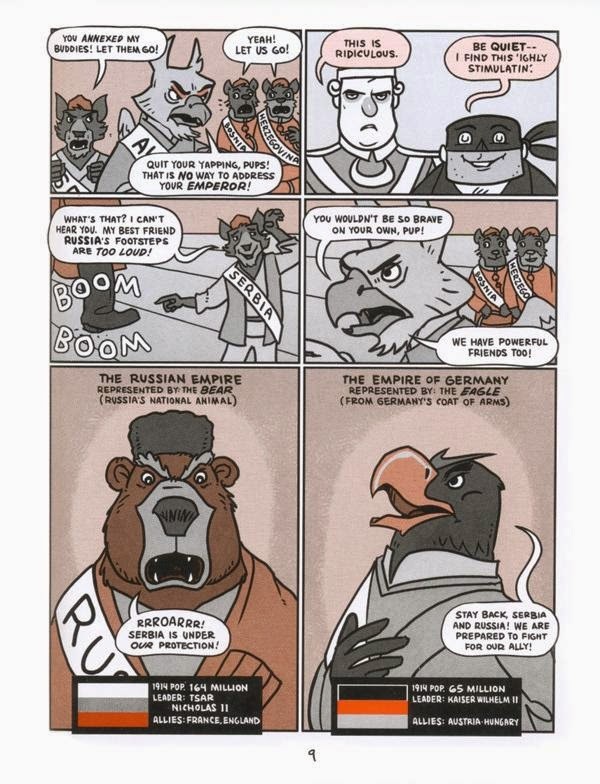 But, unlike the previous story on World War I, there is no pressing reason to read this graphic novel. There is no real lesson to be learned (other than, as one survivor put it, "Don't take no cut-offs, and get where you're going as fast as you can") and the story of the Donner party has had no real impact on our culture or our world. So if you don't know much about it, well, you can still get by. But readers will get an idea of just how brave (and perhaps crazy) these first settlers were, to travel for months on end through wilderness and Indian lands and without even really knowing what they were in for. So my overall recommendation would be to get Treaties, Trenches, Mud, and Blood before you get this one. But while there is no pressing reason to get this one, there are no real reasons not to, and it is an interesting slice of American history well and quite delicately told. You can get a copy from Amazon.com by clicking here. About the American civil war, and how the two sides each had, for the first time, ironclad ships (that cannonballs would just bounce right off of) fighting each other. I review it in more detail here. This is the first book in the series, and American spy Nathan Hale's first story is his own – when he first decided to become a soldier, his part in booting the British out of Boston, the story of the supply ship he seized - which coincides with the story of the early part of the American Revolution. That's the real thrust of the book, to give readers a look at how the war started. But at just 128 pages there simply isn't room for the whole story, so this tale ends with the end of Nathan Hale. Or rather, it ends with him on the gallows, telling stories to the Hangman and his British guard. It is the first story, but finds it's place here at the bottom because, unfortunately, the author includes an exact quote from a British General that begins with the general taking God's name in vain (page 57). That wasn't necessary. "Remember that Alamo!" - many of us have heard this rallying cry, but don't know what it is we're supposed to remember. This is the story of the stand that a 200 (or so) Texans took against a Mexican army many times that size in 1836. The Texans took their stand in a makeshift fort at the Alamo mission, and after a 13 day siege the Mexicans wiped the smaller Texan force out, leaving only a few women and slaves alive to spread the story in the hopes it would break down resistance to Mexican rule. It did the opposite - among those killed were the infamous Jim Bowie and famous Davy Crockett, and their deaths helped spark a revolution which saw the Mexicans defeated and Texas declaring its independence (10 years later Texas joined the United States). Hale does another fine job here of teaching history while keeping things very interesting, but in two instances (page 99 and 103) he again depicts God's name being taken in vain, both involving historical quotes. This would best be described as a biography of Harriet Tubman, an American slave who helped dozens and eventually hundreds of other slaves flee to freedom. She worked with many others, who would shelter the slaves as they went from one stop to the next in their journey from the slave-holding southern states to the freedom found that was to be found in Canada. These escape routes that slaves would take, traveling from safe house to safe house, came to be known as the Underground Railroad...even though very few trains were involved in their transport, and none of it was really underground (though a few secret cellars were involved). This is a fascinating story, but there is some strange mysticism included: Harriet Tubman, after recovering from a severe head injury, would claim to get visions from God. But more troubling is that this book, like One Dead Spy takes the Lord's name in vain. In this book it happens at least a couple times, which is why it, also, is at the bottom of this list. Thanks for the review! Sounds great for a school library! Yes, I would say so too. Never seen these before. Does anyone know The Place of Books blog is still up and running? Have seen no activity for a year. Just wondering?